Surprise: Freon detected around a distant star, comet | Watts Up With That? 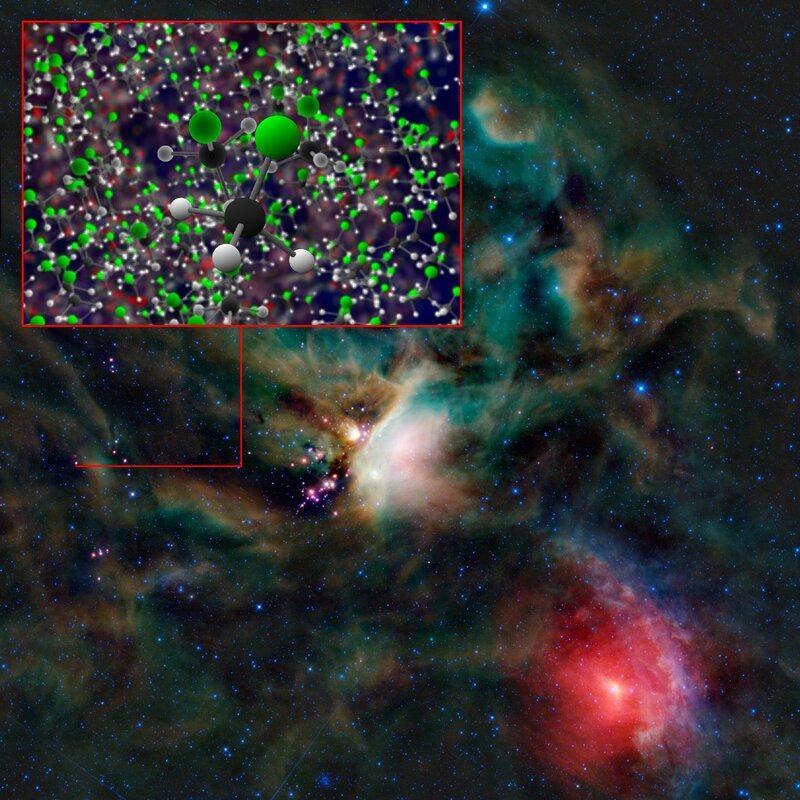 Organohalogen methyl chloride (Freon-40) discovered by ALMA around the infant stars in IRAS 16293-2422. These same organic compounds were discovered in the thin atmosphere surrounding Comet 67P/C-G by the ROSINA instrument on ESA’s Rosetta space probe. 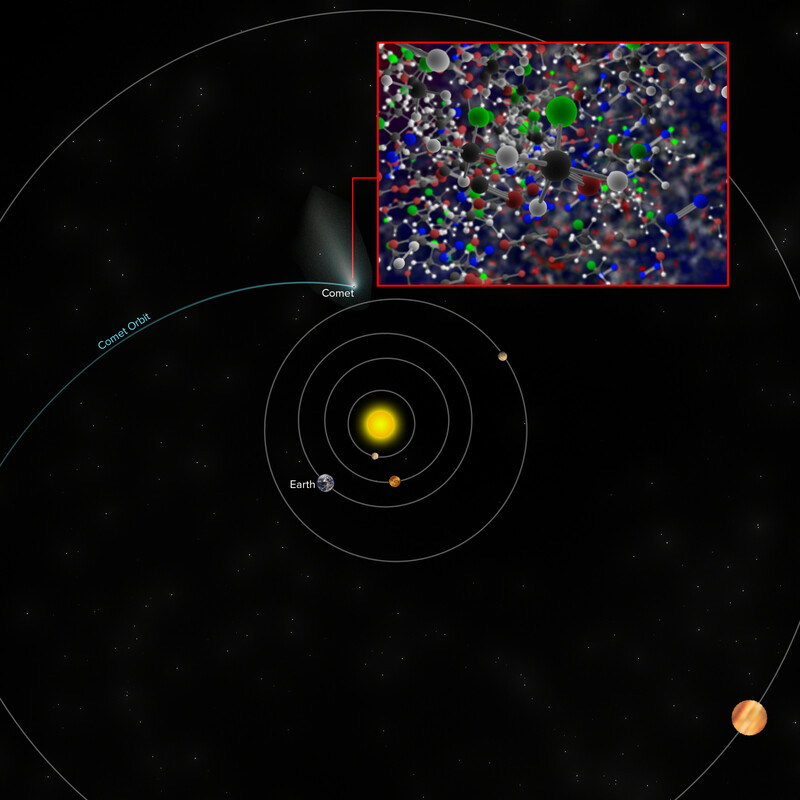 Approximate location of Comet 67P/Churyumov–Gerasimenko when the ROSINA instrument on ESA’s Rosetta space probe discovered traces of Freon-40 (methyl chloride), the same molecule detected by ALMA around the IRAS 16293-2422 star-forming region. The data used were from the ALMA Protostellar Interferometric Line Survey (PILS). – https://www.aanda.org/articles/aa/pdf/forth/aa28648-16.pdf The aim of this survey is to chart the chemical complexity of IRAS 16293-2422 by imaging the full wavelength range covered by ALMA in the 0.8-millimetre atmospheric window on very small scales, equivalent to the size of the Solar System. October 3, 2017 in Astronomy. For some reason this reminds me of Rachel Carson’s rant on how unnatural (and dangerous) chlorocarbons were in “Silent Spring”. I saw your comment after posting mine below. I followed your link and it seems that the place where they found ozone was in the high-velocity dispersion region of the Orion nebula, a star nursery. Finding ozone would be a better sign of life than finding freon, IMHO. Wow, humans are contaminating outer space.?! But you should had put /sarc tag, or you can bet some will think it for real. A few weeks back, I put up a post postulating about anthropological CO2’s ability to change the sun, and a couple of people jumped down my throat. Lucky this information comes to us from 400,000 years ago otherwise they would be jumped on by the IPCC for releasing banned chemicals into the universe. Contamination of interstellar space is against the Federation’s prime directive of non-interference. Sarc factor seven, ensign Crusher. Staggering news: Freon-40 has exited the Earth’s gravitational pull and has begun to nibble away at a star some 400 light years away, impacting a comet in the process. Freon-40 must therefore travel much faster than the speed of light. /sarc. Do you really need to get tell people that you are being sarcastic? Actually. I dont think he was sarcastic. Ironic is a better descrption. Sarcasm is not always clear, especially if someone is from another culture. Someones on the Autism spectrum is also going to have difficulty recognizing sarcasm, and such individuals are not uncommon in the worlds of engineering & science. It seems to range from Asperger’s syndrome to Idiot Savant from my experience. Exotic personalities dominate academia. “To boldly go where no bureaucracy has gone before”. “To go boldly” or “Boldly to go” please! That split infinitive has been crying out to me for a generation now. I think that planet just wanted to keep its cool, man. Any chance dry cleaning vapour (carbon tetrachloride) might be a good alternative to look for? Presumably alien life would like to keep its clothes clean too and some of the life forms I’ve seen going into dry cleaning shops…. So this means I can keep my environment-contaminating refrigerator and not have to get that Amish carpenter to build me a Hoosier icebox, after all? It’s not a complex organic molecule. I don’t think anyone should be excited by its occurrence. I would say they are disappointed not excited. They had been hoping to use the molecule as a marker for life. Maybe it’s useful for perspective purposes. True enough. There never was an ozone hole caused by Freons. There have been some excellent posts on this blog with evidence that Freon does not affect the Ozone Hole, or if it did, to an measurably tiny degree. There were other natural events that did cause the holes to wax and wane in size. Ozone is not the only substance being formed TOA. We are being protected by our atmosphere from the most energetic particles from the sun as they initiate the formation of ozone, peroxides and N-oxides from their basic compounds, i.e. oxygen, water and nitrogen. In its turn, these substances screen out some of the most harmful UV as well. As far as the ozone ‘hole’ is concerned: they never measured how much peroxides were in the hole? Now take a peek at the spectrum of H2O2 and compare it which the one of ozone/? Do you the great similarity? So, HxOx is doing the same thing as O3…. It is likely to assume that above the oceans there are much more OH radicals. Hence, peroxides are likely formed here preferentially to ozone. So, unless somebody shows us some figures [on peroxides], I very much doubt that there ever was an ozone hole. Unless someone has some proof to convince me otherwise? Most ozone is formed at the equator by UV, and that is slowly transported polewards by the ITCZ which pushes air from the ground to very high heights. While flowing polewards, some more is formed and some is depleted by natural and human chemicals (and again by UV). Ozone intensity is highest near the equator, but, despite that, UV intensity at ground level is much higher there too, due to the angle of incoming radiation (a factor 5 if I remember well). As far as I remember, there is little overall change in that process and little increase in destruction. Yes. But how much peroxides did they measure -anywhere up there but also inside the hole? The measurements you referred to, are of the radicals OH and OH2. They are in fact the building blocks of the peroxides that I referred to. given that at a certain height TOA both O2 and OH would be present at the same quantity. While it is true that there probably was a natural ozone hole every spring in Antarctica, one can’t exclude the influence of human emissions of CFC’s as chlorine donor besides the natural chlorine containing chemicals like CH3Cl. What is true is that the basic chemistry as thought before can’t be true as one of the steps is much too slow. But the overall destruction of ozone by elementary chlorine (and other active chemicals) on the surface of ice crystals at temperatures below -80ºC with UV-light is proven. OK, government funded scientists seem to have a hard time taking, keeping and managing basic temperature measurements here on Earth. So we are to believe that they can measure the occurrence of a compound four hundred light years away. Interestingly I have had several discussion with folks about planets around distant stars. Most believe we now have the telescopes where we can actually see such planets around other stars, not that the astronomers are basically using proxy data to determine whether such planets exist or not. The same folks also believed we will soon be traveling, with in their life times, to such distant stars and planets. They believe it should be a priority since we are destroying earth with carbon dioxide emissions. Quite strange that the researchers are surprised, as CH3Cl, methylchloride is a trace compound in volcanic gases. That is known for many years. Here in a book from 1996. It’s not clear how the presence of methyl chloride can be considered a precursor to life. Life on earth requires amino acids (compounds of carbon, nitrogen, oxygen and hydrogen, with some containing sulfur) and DNA (compounds of carbon, oxygen, hydrogen, and phosphorus), but the chlorine atom only plays a minor role in the chemistry of life. Most of the naturally-occuring chlorine on earth is bound in inorganic ionic salts, either as solids or dissolved in sea water (as sodium chloride). It’s true that the stomachs of most mammals (including humans) contain hydrochloric acid (HCl), but it is formed from sodium chloride in the diet, rather than from methyl chloride, which is a very rare gas in earth’s atmosphere. It is interesting that methyl chloride was found on a comet, far from any human-made refrigerators. This simply means that detection methods keep improving. Pretty soon the EPA will use them to ban anything containing more than 0.0000001% of Freon or Arsenic. Obviously the shattered remnants of doomed worlds that used Freon. There are numerous carbon-based molecules produced by stars when they die. For a list of some interesting and unusual ones, see “Up the Starry Chimney”, a New Scientist article. Life on stable planets around stable stars is inevitable. Freon was certainly a precursor to life in the Houston area. I’m still waiting to see how much the “cleanup” will cost according to the EPA. So someone 400 light years away has fridges! Lets put Oliver Macron, Leonardo DiCaprio, Al Gore and a bunch of UN officials on a space ship to get them to sign up to the Paris accord. Freon ? that comet is just an old fridge. All this nonsense has much more to do with the economics of selling R-134a at $1.50/oz instead of R-12 at $0.68/lb than anything to do with science and saving the planet…..
Only specific freons are banned, not all of them.